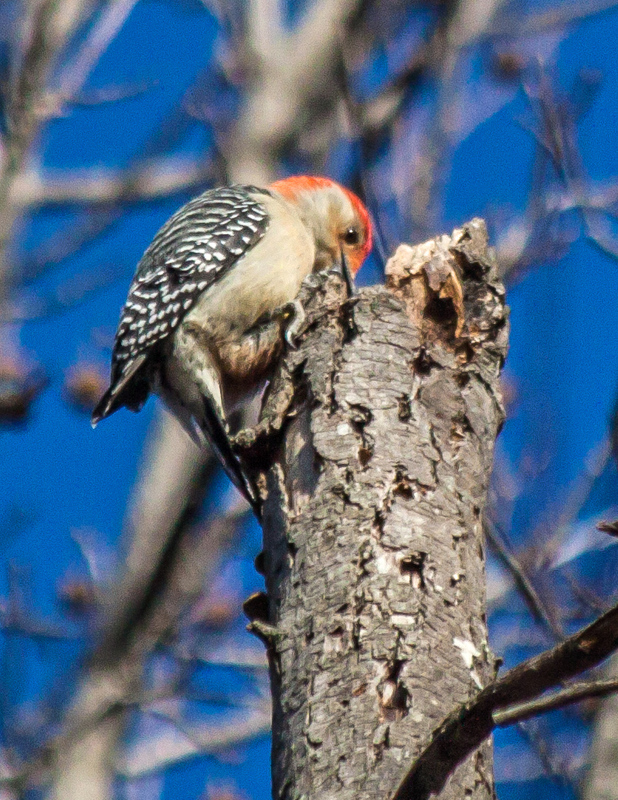 Why was this Red-bellied Woodpecker (Melanerpes carolinus) pecking so feverishly at the top of this broken tree? It certainly did not look like a good spot to find insects. 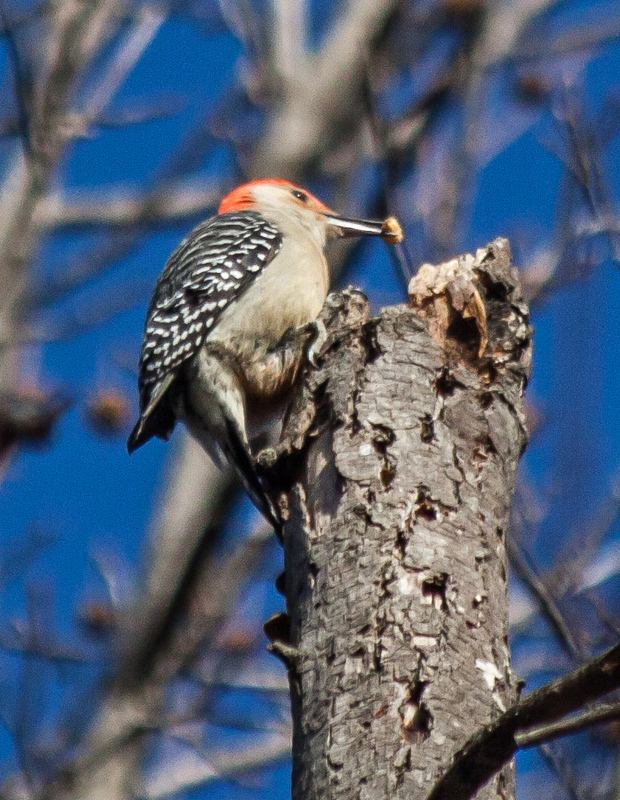 A few seconds later, I got an answer to my unspoken question, when the woodpecker pulled an acorn out with its beak (at least that’s what I think it is). 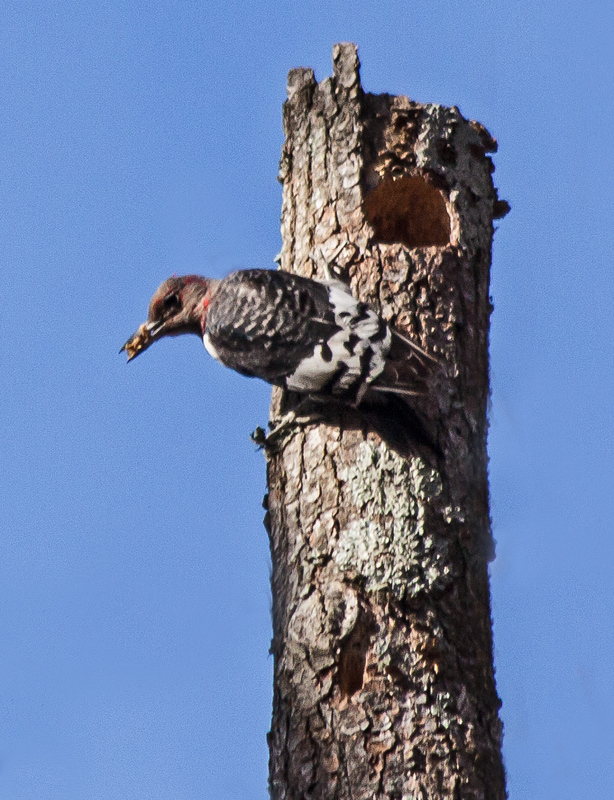 After a bit of research on the internet, I learned that these woodpeckers eat plant materials, like acorns, as well as insects and that they sometimes use cracks in trees to store food for use at a later time. I don’t know what it was about Autumn Meadowhawk dragonflies, but they really seemed to like to perch on me during several sessions when I was stalking them with fellow photographer and blogger Walter Sanford, who was able to capture shots of them (including mating pairs) on various parts of my clothing and body. His shots are wonderful and provide some great views of these colorful dragonflies, which seem to have disappeared with the arrival of frigid weather in our area. Autumn Meadowhawk dragonflies (Sympetrum vicinum) like Mike! Mike Powell, that is, a.k.a. “Meadowhawk Mike.” The following photos were taken at Huntley Meadows Park on 15 November 2013. Each set of images, or individual image, features a different dragonfly (or dragonflies) perching on Mike at various times during the day. Disclaimer: No dragonflies were either injured or killed in the making of these photos. Now you see it; now you don’t! A male dragonfly perching on Mike’s shoulder, that is. Or was. A time-series of images showing a mating pair in tandem. Mating pairs are usually more skittish than this male and female. Sometimes the same dragonfly — or more than one dragonfly — perched in different places. Another male, testing a couple of perching places. A male on Mike’s arm. Wouldn’t you know it, I finally see a Red-headed Woodpecker (Melanerpes erythrocephalus) and its head is not red. It’s a juvenile one and if you look closely you can see a few traces of the spectacular red that it will eventually sport on its entire head. One of the serious birders at my local marshland park identified the area in which two juvenile Red-headed Woodpeckers had been seen regularly and I was fortunate to spot one of them this past Monday. 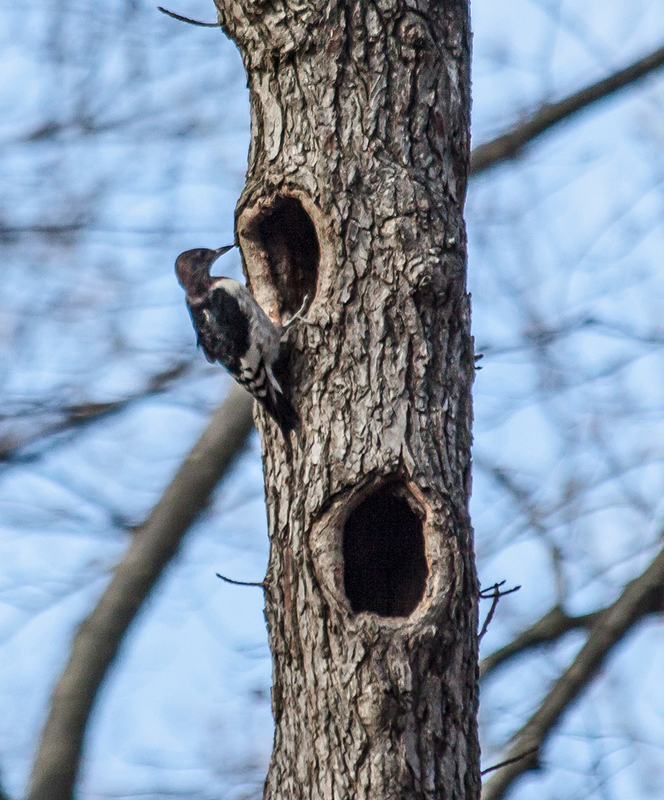 The woodpecker seemed to be carving out a cavity in the tree and actually climbed into the hole as it chiseled away the bits of wood. Earlier, I saw one of them in the distance at a nearby tree with two large cavities (see the third photo). The bird stuck its head inside one of the cavities and I couldn’t tell if it was checking out the hole or was storing food there. 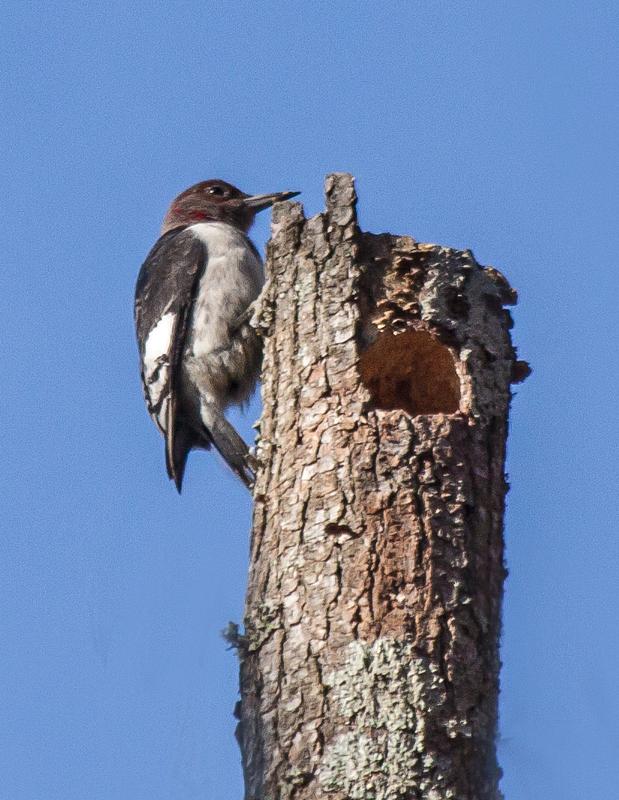 The Cornell Lab of Ornithology notes that the Red-headed Woodpecker is one of only four North American woodpeckers known to store food, and it is the only one known to cover the stored food with wood or bark. These woodpeckers have a varied diet and will eat both insects, which they sometimes catch in the air, and a a number of plant materials, especially acorns. I don’t know how long it will take for this bird’s head to turn red, but I will certainly be keeping an eye out for it, now that I have an approximate idea of its territory. “Do you want to go photograph some produce?” How was I supposed to respond to this question posed to me early in November by my photography mentor and fellow blogger Cindy Dyer? How exciting can produce be? I have grown up in a world in which I buy my produce in a supermarket. That produce has been scrubbed and processed and transported from far away. I was pleasantly surprised when Cindy took me to Nalls Produce Center, a local produce market that has a wide variety of items that I have never seen in a supermarket. 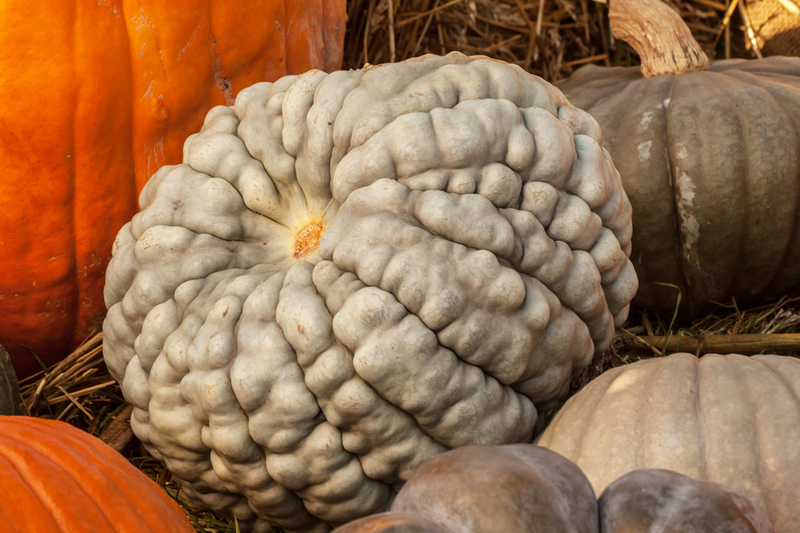 Who knew, for example, that pumpkins were not always orange with smooth skins? I was pretty uncertain about how to photograph the produce, so I just concentrated on shapes and colors and textures. It somehow seems appropriate to post this selection of photo on Thanksgiving Day, a day when Americans traditionally celebrate the bounty of the autumn harvest. 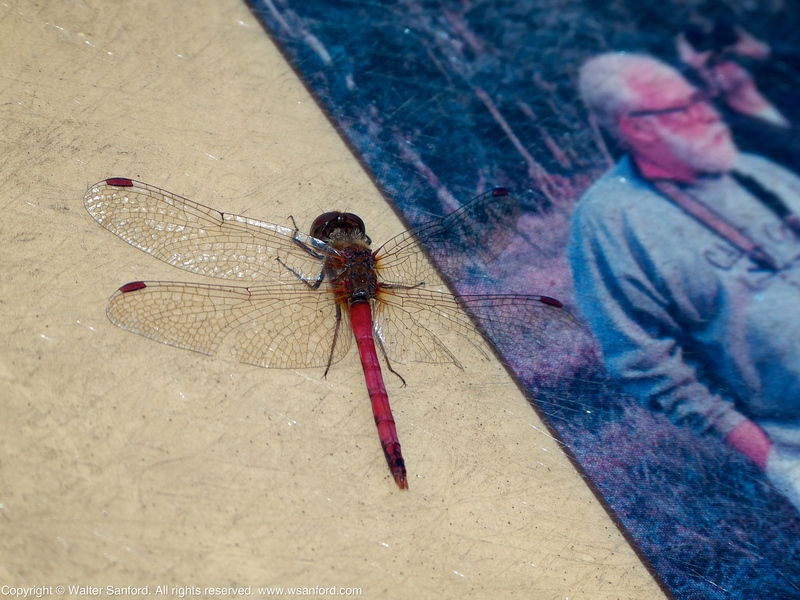 When a dragonfly landed on a sign at my local marshland park, one of my favorite places for photography and reflection, it seemed to be sharing reminders with me and with fellow photographer and blogger Walter Sanford about the proper approach to observing wildlife (and life in general). Food for thought on the traditional day when we give thanks for our many blessings. I am especially thankful for the opportunity to be a frequent and careful observer of the natural beauty of the hemi-marsh at Huntley Meadows Park, and for many good friends with whom I share the experience. And thanks to WordPress.com for the free blog that enables me to share my sightings with others! 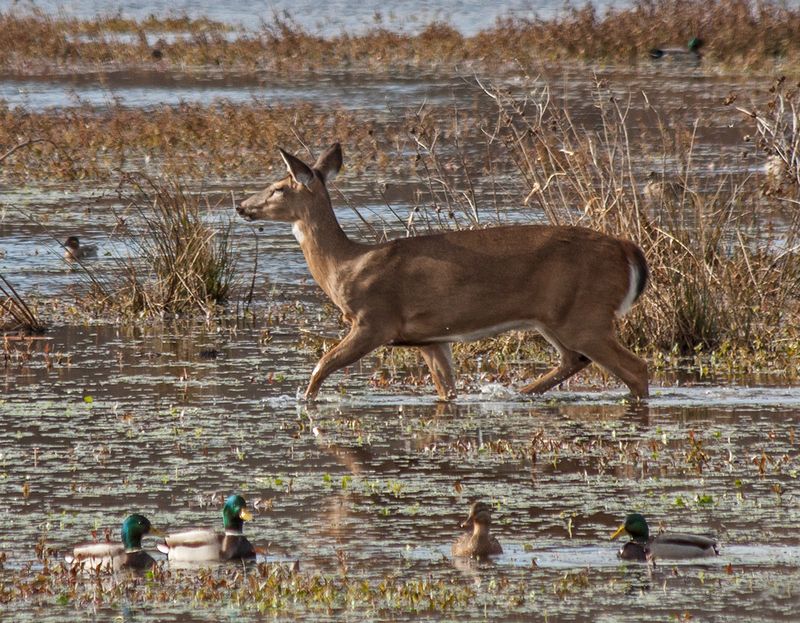 I don’t often see deer in the daylight at my local marshland park, so I was a bit surprised last week when a doe came running out of the cattails and began to pick her way thought the ducks that were foraging in the shallow water. 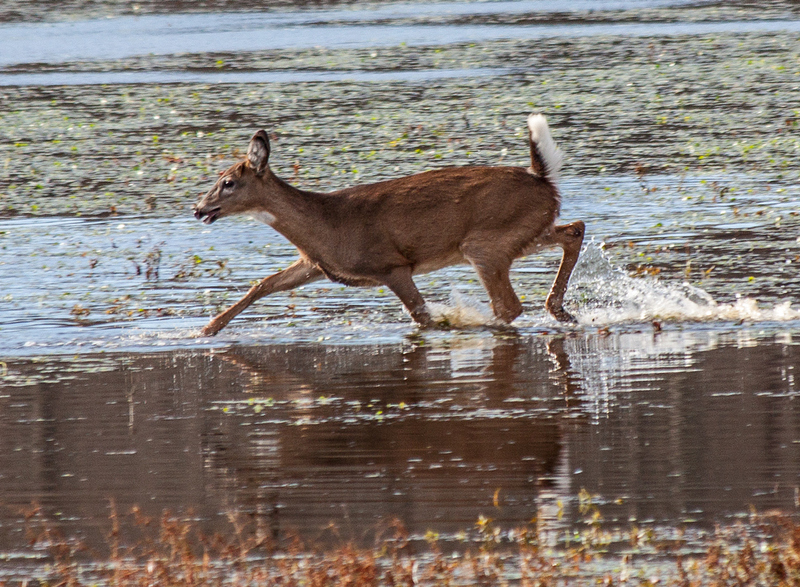 She was immediately followed by a smaller doe, who was also running. What was going on? What had spooked these two deer? I didn’t have to wait long for an answer. 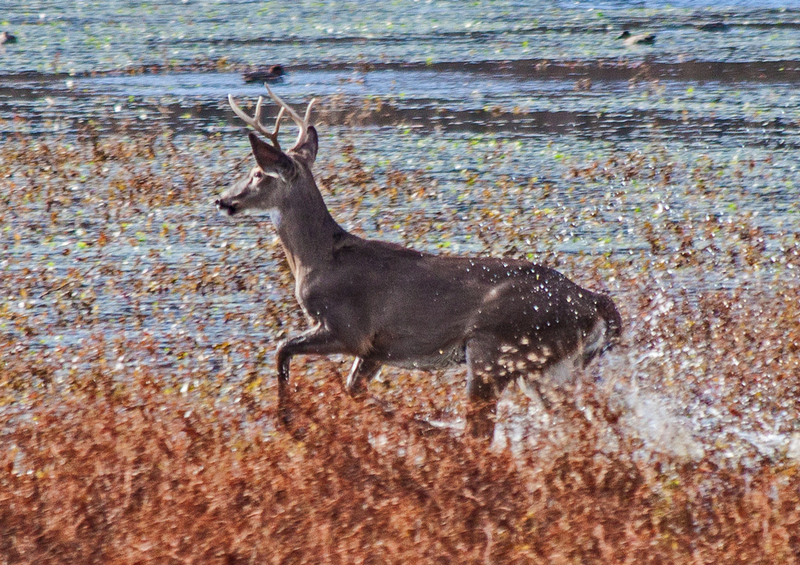 A small buck emerged and started chasing the other two deer through the water. 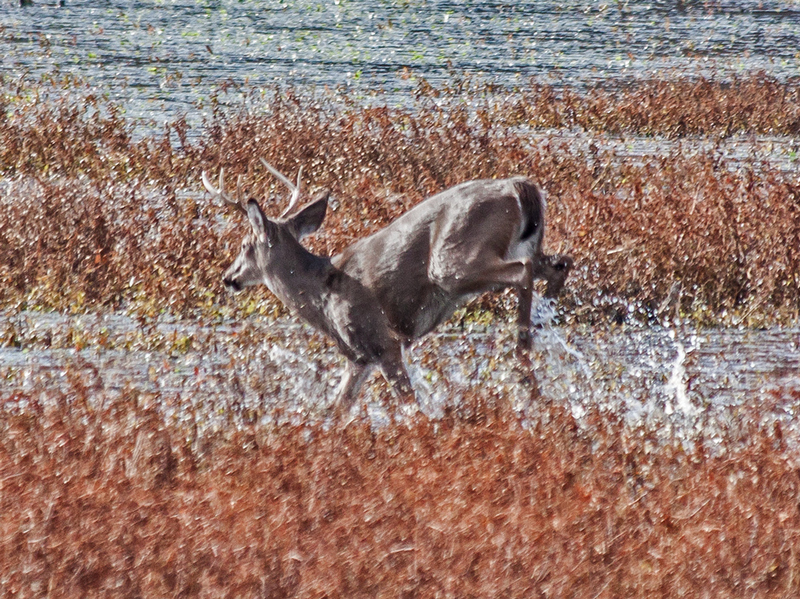 I don’t know if they were just playing or if the buck had amorous intentions, but it gave me the chance to get a few shots of what passes as “big game” for me. It was cold enough Monday that the pond at my local marsh froze over. 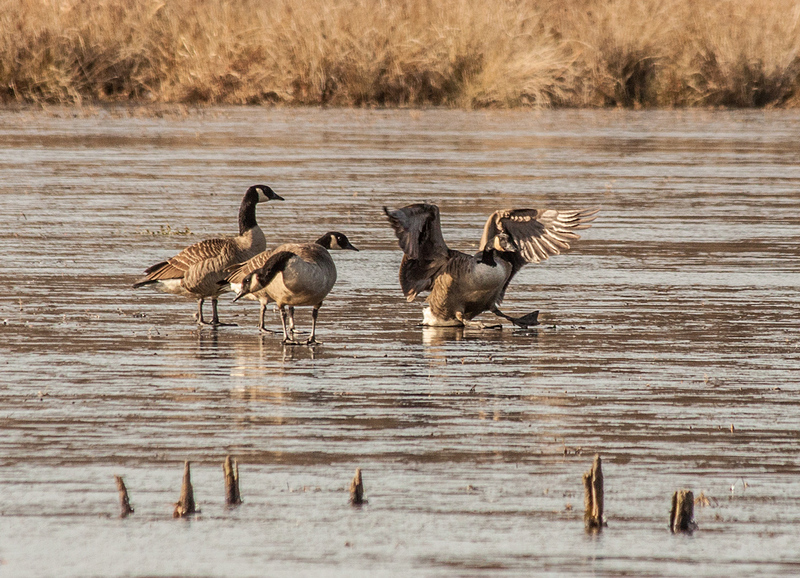 The ice may not have been thick, but it complicated landings for migrating Canada Geese (Branta canadensis). One goose slid to a stop by lowering its tail, as other geese watched with varying degrees of interest. It has warmed up a bit and we’ve had a lot of rain since Monday, so the ice is almost certainly gone by now, but I suspect that I will see this scene repeated as we move into winter.